In 2005, I marched my rookie season in my college band. None of us knew during band camp what was in store for us that year considering the year before our football team went 4-7. Flash forward 13 weeks and we were 11-1, Big Ten Champs and ranked #3 in the country. The Orange Bowl, a BCS Bowl at the time, was in our sights and no one knew what to expect. The hype leading up the game was unreal. A match-up of two power-house programs with legendary coaches. Penn State vs Florida State. A game for the ages. Bowl trips aren't the typical up and back trip that we are used to during the season. They aren't dominated by one team's fans. They aren't an opponent that you've seen three times before. They are a powerful experience for an 18 to 21 year old and no matter how many bowl trips a band member goes on, each is special in it's own way. They simply are the best trip you will take in your college career with the band. 1) 3-5 Days with your best friends - Typically when we travel for away games we are up and back sometimes in the same day. Getting an over night for an away game is always met with great enthusiasm especially when you think about the friends who bunked with you in your room. However, at bowls you get three to five days with your best friends and a chance to make life-long memories. Nothing is better than going on vacation with 300 friends. 2) Pre-Bowl Rehearsal - Coming back to campus for 2 days before we left for the bowl was EPIC. You're the only ones on campus. You're camping out at a friends apartment because the dorms are closed. You are there to work, but you always find a way to make those two days a blast. 3) The Flight - For some bands a bowl trip is a quick bus ride, but when you live in the middle of Pennsylvania and you have to go to Florida or California, the flight down is always a blast. Making friends with the flight attendants, getting pep talks from the pilot, singing the fight songs and then the spectacle of walking through the airport terminal. Walking through the terminal you feel like a celebrity. People run to take pictures of you, they shout your team's cheer and they come say hello. It is that moment when you know this is different than a typical trip. 4) The Warm Weather - Now, I know this is not the same for everyone, but for those of us who travel from a cold weather place to a warm weather place for the bowl game, this is a HUGE deal. Especially if a beach is involved. If you live down south you'll never understand the "Christmas morning glee" we felt when we heard that we were going to travel to warm weather. It's a northerner thing. 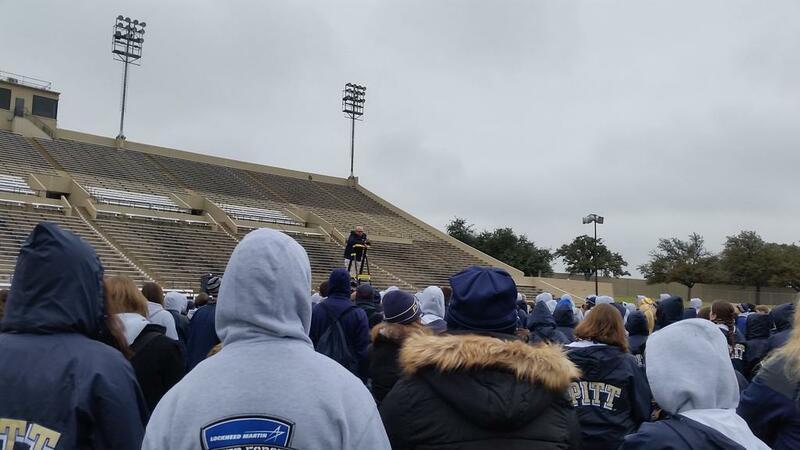 5) The Bowl Events - On a typical away game the band will have rehearsal at a local field of some kind and then you head over to a mini pep rally or a small pep band heads to the pep rally to get the thousand or so fans fired up. At a bowl game the bowl events are FILLED with your fans. THOUSANDS of them! 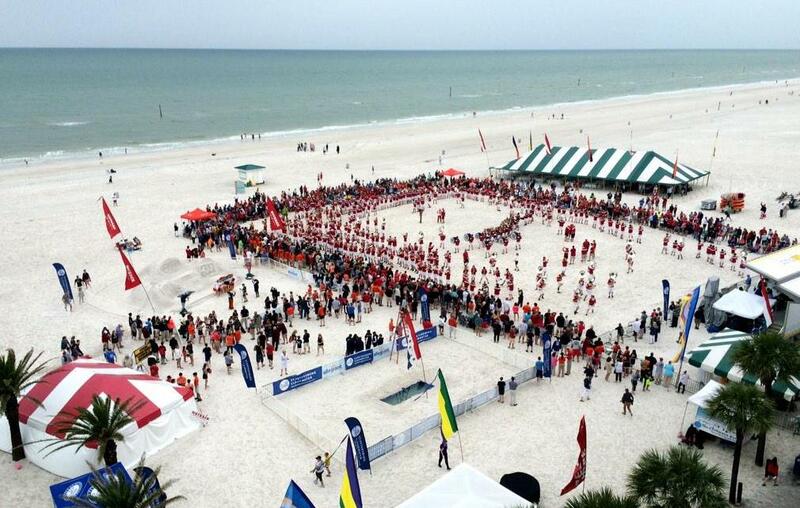 Pep rallies on the beach or in the city. Fan Fests and cook outs. Everywhere you go you will be blown away by the turn out of fans and the fun you will have at the bowl events. Seeing the thousands and thousands of fans lining the streets of the Rose Parade was like nothing I had ever seen before. If you're lucky you'll get to march in Disney World, or on an aircraft carrier or even play off the balconies of buildings. Yes, that happens at certain bowls. 6) The Other Band - Meeting the other band usually was a result of us both parking in the same parking lot before a parade or event. At first you don't know if you should go over or not and then someone eventually breaks the ice. Meeting the other band is a great moment. Sure you want to win the game, but you're both there to represent your school and appreciate the other band. You know how hard they work. Then you warm up and get ready to roll. Let's be honest, you play a little bit better when you know the other band is right next to you analyzing everything you do. If there is a battle of the bands, you play your face off. 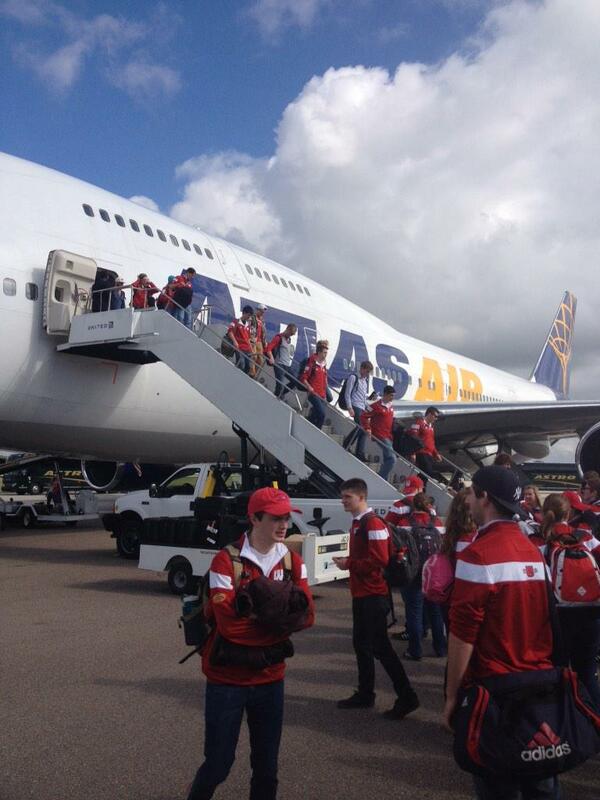 These moments don't happen on an away trip. 7) The Food - You will be fed and you will be fed well. Eating Outback at the Outback Bowl...awesome. Or In and Out at the Rose Bowl...mmm. 8) The Game - Entering into the stadium is an experience in itself. A neutral environment with a stadium split 50/50 is an unbeatable atmosphere. Some bands have been lucky to travel with their teams during the season to neutral site games, but the bowl trips used to be the only time this happened and for the majority of bands this is the only neutral site game you'll experience all season. One half of the stadium one color while the other half is another. Take pictures and soak it in. You'll never hear louder boos or bigger cheers. I remember seeing half the stadium in Miami doing "the chop" with the Marching Chiefs leading the charge and got goosebumps. Nothing beats the spectacle of college football. Don't forget, you'll be on TV. Legitimately on TV. Most bowls show nice portions of halftime. Leave it all out on the field. This is your last time to march for 9 months or for the seniors, your last time ever in that uniform. 9) The Journey Home - At some of the bowl games we opted to not take the bus or flight home and extended our trip in the bowl city for a few days. The time spent after the trip together with our friends was incredible. An extra few days together one final time before our final semester was worth every penny of paying for our flight home after the Rose Bowl. If you're allowed to do it, I highly recommend it. 10) Going Out On Top - Ending your career as a senior with a bowl game is the icing on the cake. 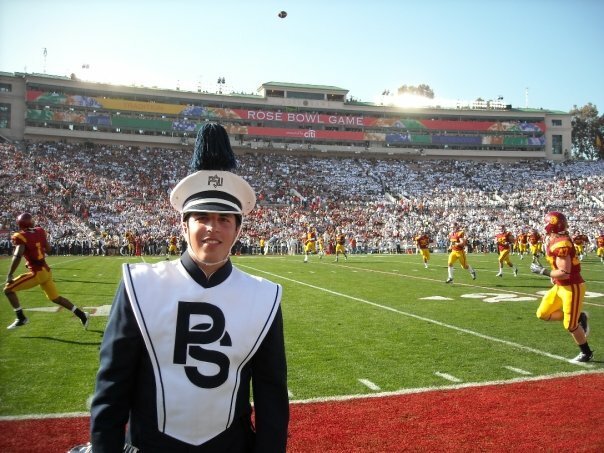 For me it was a dream come true to march at the Rose Bowl in my final game as a college marcher. However, marching at any bowl game for your final game is a special experience. The entire trip culminated with a great halftime performance and if you're lucky a big football win is a great way to end your career. You'll look back on those few days you spent with your fellow seniors and remember how lucky you were to have that experience together. It will never leave you. For those of you who are heading out in the next few days/weeks on your bowl trip, please do us all a favor and soak in every moment. Take as many pictures as you can, videos and meet as many people as you can. Make friends with the opposing band and thank the fans for coming. Eat all the great free food and march the best show you've marched in your career. 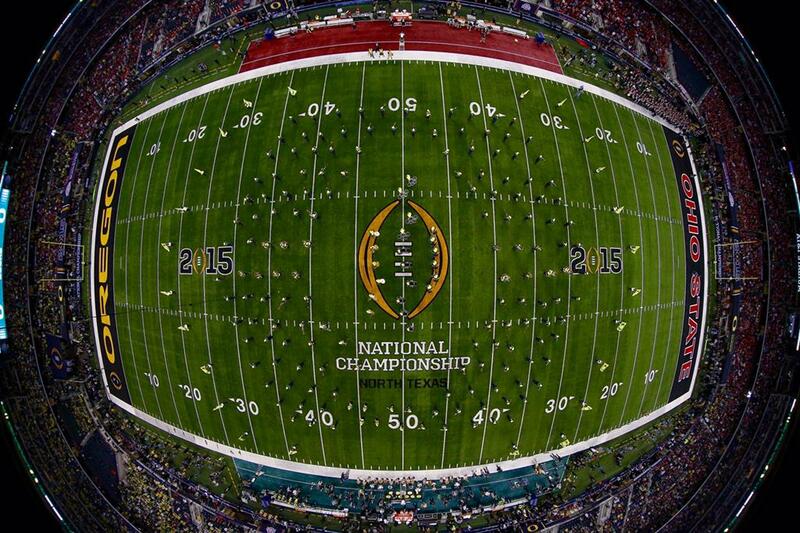 Who knows, next year your team could be 4-7 and you'll be at home while other bands get a chance to travel. With that in mind I leave you with a final phrase that my Band Director, Dr. Richard Bundy used to say to us before big games, "Carpe the heck out of the diem."